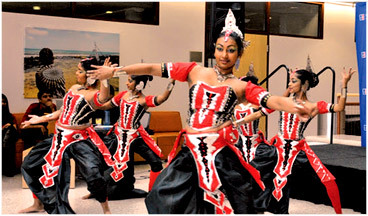 Arts are an excellent medium to promote unity, Sri Lankan ambassador to US Jaliya Wickramasuriya said. Delivering the keynote address at the annual South Asian Arts Festival at the American University in Washington DC, he said: "In the world we live in today, there is entirely too much focus on differences that we may share as humans, but not the things we have in common." The opening of the day long festival was held at the university premises on April 6. "Fostering discussion among students and scholars, as well as enjoying what these talented South Asian performers have to showcase, is an excellent way to look past those differences and come together to promote the creativity and unity that can be conveyed purely through music, dance, theater, and other visual arts," he said. Ambassador Wickramasuriya opined that promoting culture is a powerful tool of diplomacy as it helps to build bridges between communities through increased opportunity to learn about each other. The student organisers described the intercollegiate South Asian Arts Festival (SAAF) as a platform to generate discussion of South Asian art and diasporic identities. The festival featured South Asian arts in different mediums including music, dance, paintings, drama, movies, literature and poetry. Choreographer Chathuri Wickramarachchi , together with Sarindee Wickramasuriya, Fenoli Lowe, Dinali Weeraman, Natalia Adikarige, and Amali Perera of the Sri Lankan dance group performed a fusion dance item combining the different traditions of Sri Lankan dance. 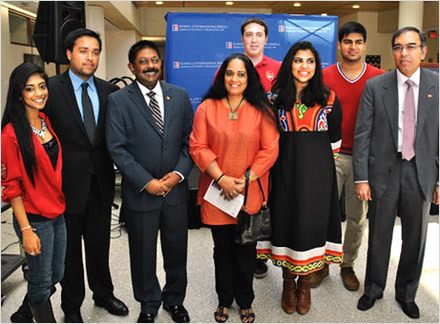 The festival also featured South Asian food, panel discussions, movie screenings, and number of guest speakers.